This book is an extensive study on the Old Testament tabernacle and its priestly system, which has been called “God’s masterpiece of typology.” Whereas the record of the creation of the universe takes up two chapters of the Bible and the fall of man takes up one chapter, the tabernacle, with its priesthood and offerings, takes up 50 chapters. It is obvious that God has many important lessons for us in this portion of His Word. Speaking personally, nothing has helped me better understand the Triune God and the salvation that He has purchased for man, and I believe that I can guarantee that the reader will be taken to new heights in his understanding of these things. Everything about the tabernacle points to Jesus Christ: the design, the materials, the colors, the court walls and pillars, the door into the court, the sacrificial altar, the laver, the tabernacle tent itself with its boards and curtains and silver sockets, the tabernacle gate, and veil before the holy of holies, the candlestick, the table of shewbread, the incense altar, the ark of the covenant, the high priest, and the offerings. All is Christ. The tabernacle system offers brilliant, unforgettable lessons on Christ’s person, offices and work: His eternal Sonship, His sinless manhood, His anointing, His atonement, His resurrection glory, His work as the life and sustainer and light of creation, His eternal high priesthood and intercession, and His kingdom. 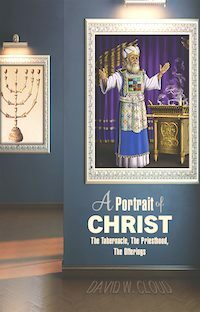 In addition to the studies on every aspect of the tabernacle, A Portrait of Christ features studies on the high priest, the Levitical priests, the five offerings of Leviticus, the day of atonement, the ransom money, the red heifer, the cherubims, strange fire, the golden calf, leprosy, the Nazarite vow, the pillar of cloud and pillar of fire, and the transportation of the tabernacle through the wilderness. The tabernacle is very practical in its teaching, as it also depicts believer priests carrying Christ through this world (1 Pet. 2:5, 9). Like the Israelites in the wilderness, believers today are on a pilgrimage through a foreign land on the way to our eternal home (1 Pet. 2:11). eBook illustrations are in color.